Chef-owner Sal Marino, has delighted Los Angelenos for the past decade with his contemporary, market-driven approach to traditional Italian cuisine. Centrally located near the intersection of the 10 and 405 freeways, Il Grano draws a steady crowd of well-heeled Westsiders craving pristine crudo, house-made pastas, and unpretentious entrees. He writes a new menu every month, to capitalize on “whatever swims in the ocean and grows on Mother Earth.” Noted sommelier Peter Birmingham keeps pace with inspired wine pairings and pastry chef Corinne Sidelsrud’s desserts share Marino's seasonal approach, minus the swimming ingredients. 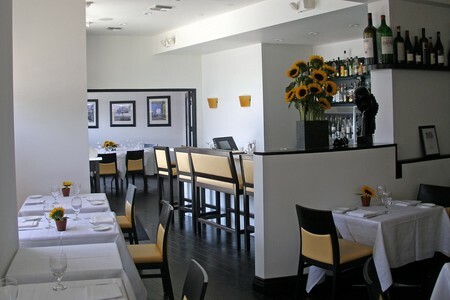 Il Grano, a contemporary Italian restaurant in West Los Angeles, is named in honor of grain, the basis for pasta, pizza, and bread. It was opened in 1997 by Sal Marino, a Naples-born and trained chef with an ambitious vision. A decade later, thanks to Chef Marino’s devotion to market-fresh ingredients and Italian culinary traditions, Il Grano rates among the best restaurants in Los Angeles. Il Grano is convenient to the upscale neighborhoods of Westwood, Santa Monica, and Brentwood, attracting a steady stream of well-to-do Westsiders for special-occasion dinners and relaxed lunches. The restaurant’s already-potent drawing power was recently bolstered with the addition of well-regarded sommelier Peter Birmingham, whose wine pairings are gospel for Los Angeles oenophiles. Sal Marino and his wife are responsible for Il Grano’s sleek interior design. A black-and-white color scheme predominates. Upon entering the front door, there’s a private room to the left with a large circular table, for private parties. There’s a centrally located bar with a few stools, where it’s possible to order from the menu. To the right is the main dining room, lit by wavy white Murano lanterns and sconces. On each table sits a single sunflower and a transparent oil lamp, which only burns at night. A painted burgundy triptych hangs on the rear wall, which Chef Marino commissioned from Venice beach artist Danny Kaplan. The painting reads “Ready Set Let Go,” instructing Il Grano diners to be in the moment. To start our meal, we were each presented with a warm square of house-made focaccia, dusted with rosemary and salt, plus a chewy semolina-crusted roll. 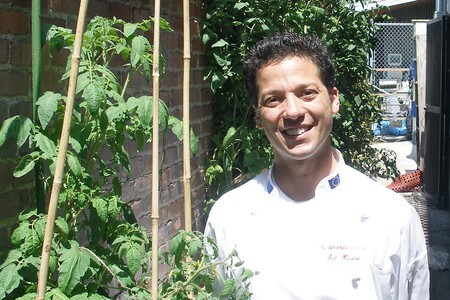 Chef Marino releases a new menu each month, based on what’s fresh. Every July, to celebrate the arrival of tomato season, he uses over 40 varieties of heirloom tomatoes from his private garden. Given his passion for tomatoes, my dining companion and I both kick-started our meal with a special plate of heirloom tomatoes – red, yellow, orange, green, and burgundy – lightly dressed with olive oil, sprinkled with freshly-ground black pepper and topped with a dollop of creamy burrata, the Rolls Royce of mozzarella. It was a simple, terrific salad that was absolutely of the moment. For my appetizer, since Sal Marino is considered a leading arbiter of Italian raw fish, I selected the Crudo. Each evening, Chef Marino serves six to eight different tastes of pristine fish, depending on what he finds at the market. My waiter conveyed the chef’s instruction to begin at the upper right corner and work my way counter-clockwise around the rectangular, frosted-glass plate. Starting with a single slice of pleasantly chewy octopus, I discovered a silky slice of Japanese red snapper, sprinkled with pepper; amberjack topped with slices of green onion; herb-flecked fluke wrapped around crisp vegetables; a thin-slice of Maine scallop topped with a cross of sweet yellow beet; albacore topped with bursting salmon roe; luscious snapper tartare; and a thin square of rosy bluefin tuna, topped with a dollop of citrus emulsion and served on a bed of cole slaw-like grated daikon. Il Grano offers 25 wines by the glass or half-glass. My dining companion and I chose the latter, so we could try more wines. Peter Birmingham, a noted sommelier who previously worked at of Norman’s on Sunset, is new to Chef Marino’s team. Based on his reputation, we trusted him to pair wines with our appetizers and entrees. For my crudo, he selected Riesling Kabinett “Veldenzer Elisenberger” Max Fred, Richter, 2005, which offered cool, sweet interludes between each bite of fish. For her appetizer, my dining companion selected one of the evening’s specials: beer-battered squash blossoms, stuffed with sheep’s milk ricotta, plated on a puree of San Marzano tomatoes with decorative micro-greens. The crisp batter shell played beautifully against the creamy cheese and the intense tomato sauce. With the squash blossoms, Mr. Birmingham suggested Getariako Txakolina, Talai Berri B. Elizagirre, 2005, a crisp, dry white wine from Spain’s Basque country. As an intermezzo, Sal presented us with a branch from one of his tomato plants, holding a pair of plum tomatoes. With the slightest pressure from my teeth, the grape-sized tomato released sweet juice. Our intermediate course, Raviolo Aperto, consisted of “open face” Maine lobster raviolo with house-made spinach pasta and yellow corn. The bowl was lined with five-by-five-inch sheets of green, spinach-fortified pasta and topped with sweet yellow corn pudding and plump nuggets of lobster claw and tail meat. For my entrée, I ordered one of Chef Marino’s signature dishes, Branzino al Sale, oven-baked Mediterranean striped bass, which our waiter presented to us on a silver platter. The salt-masked fish was retuned to the kitchen, where it was filleted, then presented again on a white plate, framed by organic summer vegetables. The salt crust locked in the juices, so the fish was especially moist. The vegetables consisted of florets of purple and yellow cauliflower, a cut of artichoke heart, quarter-sized cuts of zucchini, spears of squash, orange and yellow carrots, a single spear of asparagus and baby bok choy. The vegetables had been blanched then chilled three times, brought to temperature and finished in a seasoned skillet, a process that really brought out the natural flavors. With this, Mr. Birmingham paired PINK, Villa Creek, 2006. Blending Mourvedre, Grenache and Syrah Rosé grapes, the rosé proved to be a cool, subtly-sweet repast. For her entrée, my dining companion selected Petto d’Anatra, rosy slices of Muscovy duck breast with arugula-snow pea sauce and honey mustard-bacon reduction. The duck fat that rimmed the slices was crispy and luscious. With the duck, Mr. Birmingham paired Veronese Rosso Primofiore Guiseppe Quinterelli from 2003. This big red from Italy held up well to the rich flavors of the duck and bacon. Executive Pastry Chef Corinne Sidelsrud, previously of Patina, clearly appreciates similarly seasonal ingredients. As good as many of the berry and stone fruit-focused desserts looked on the menu, we were well-sated, and could only manage to split a single selection. I liked the element of surprise in the Piccola Pasticceria della Casa, a mystery plate holding anywhere from 8 to 15 house-made pasticcerie, depending on the whim of the kitchen. In keeping with Il Grano’s seasonal approach to dining, we opted for Zuppa di Pesche, a peach soup containing slices of white peach and three dollops of Laura Chenel goat cheese cake. The rim of the white bowl was accented with a walnut Florentine, a thin walnut crisp, and a small sprig of mint. After eating at Il Grano, it was evident that the lessons that Sal Marino learned in Italy about freshness and authenticity have translated to Los Angeles. Sommelier Peter Birmingham enhanced the dining experience with his thoughtful wine pairings, and Corinne Sidelsrud’s dessert was a fitting conclusion. Eggplant filled tortelloni, tomato sauce, baked eggplant "boat"
A friend wanted to take us to what he claims is the "absolute best" restaurant around! Well last week he took us to Il Grano's on Santa Monica Blvd. I have to admit he knows his restaurants! The food was excellent as was the service! It is one of those restaurants that you just plan on dinner taking a couple of hours because of the service and the way the food is prepared and presented. It is absolutely second to none! Prior to ordering the waiter came to our table with some background on the restaurant and asked what foods we most enjoyed. He also asks if you have any allergies to certain foods or if there are any specific foods we disliked. All of these questions were asked to better assist us with our dinner selections. Basically we didn't order our dinner; we left it up to the chef. 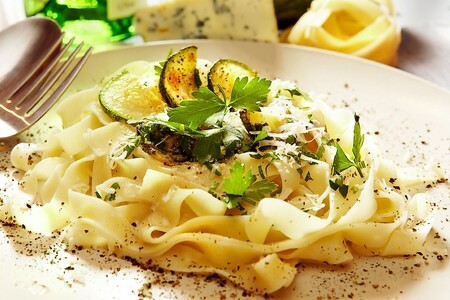 Based on the questions that had been asked by the waiter, the chef prepared our meal. We had a four course dinner that was absolutely superb! Although there was not an empty table in the restaurant, I noticed that during and after dinner, the chef, who is also the owner, came out of the kitchen, went around to several tables, introduced himself and asked about their dining experience. THAT IS SERVICE AT ITS BEST! I WOULD RECOMMEND THIS RESTAURANT TO ANYONE WANTING AN UNFORGETTABLE DINING EXPREIENCE!